Saturday - my parents came over to our house and we got to visit. Then we went and ate lunch and hit a baby store in town. Mom brought me a bunch of cute, cute, dresses for Harper (I'll post them on the next post) and a little swimming pool for her. :-) We had a good time seeing my family. Here is Scott, me and Harper on her first game day! I think we have a little hog fan on our hands - I could really feel her kicking at the game! I think she was a little disappointed through most of the game at how we were playing but she was happy at the end. ha! It was SOOO hot. 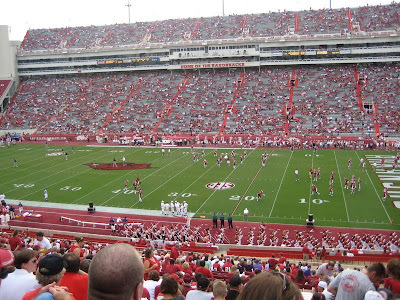 University of Arkansas is lovingly called "the Hill" because it is up on a huge hill. When you walk to the game - no matter where you park - you have a big climb ahead of you. I just about died. I was wondering how on earth I'm going to manage this at the last game in November. I'm determined to make it to every game this season but we may have to wait and see. These are our friends Hillary and Josh. They sit right in front of us at the games! 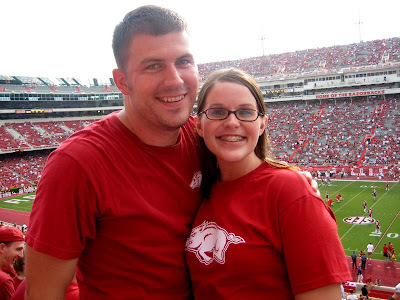 This was their last game as a dating couple because they are getting married in less than 3 weeks!!! Sunday after church - Scott and I made home made Ice cream for the very first time. We got a maker for our wedding but I've just never thought about using it. 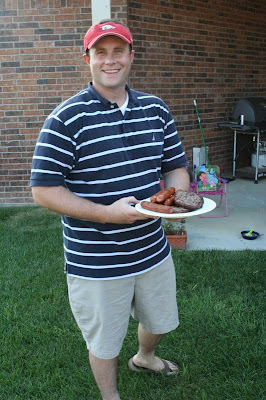 Laurie and Steve asked us to come over for hamburgers that night so Scott said we would make ice cream. It was actually easier than I expected so we might start having it more often. (I should probably admit that I decided to make a peach cobbler to go with it and I used a paula deen recipe and I used the wrong kind of flour (all purpose instead of self rising) by accident and it was NOT edible). Oops. We all have cooking disasters, right? Emily liked it. She put on a show for Scott and I of course. She is personality plus. Laurie gave me a bunch of cute maternity clothes and baby sleepers. I am SOOO thankful to have a best friend who has recently gone through pregnancy and newborns because she gives me so much good advice. She is going to be a huge help to me - already has been. I can't wait to see all of Harper's new clothes you and your mom bought!!! You and Harper looked so cute for the game! I was a little worried during the game, and all through the fourth... but Casey saved the day! We had so much fun last night! The ice cream was delicious! I love being your baby guide! ha ha! I LOVE pregnancy and babies! You look so very cute with that little baby bump. I love it! Emily is so upset looking at the picture of Dawson. She thinks he does not have eyes. She is having a fit! hahaha! I actually thought about you walking UP to the game on Saturday. Then, my mind raced to you being hugely pregnant walking UP to the game! Looks like a good time had by all. I tagged you over at my blog if you would like to play along. Seeing you dressed up for the game made me jealous! I love (as much as you) coordinating my outfits for the games! You look cute! Looking at that pic from your seats...it looks like you guys may sit close to us! Except I think we may be one section closer to the end-zone. Our seats are close! I checked with David and we are gate 13, section 111. It was sooo hot. My makeup was running by the time I sat down. Yuck!! Glad ya'll had such fun at the game! Wait til next year! :) That will be so fun! I loved that picture of you and Scott! oh Kelly, your bump is soo cute and you are rocking those maternity jeans! you are so blessed to have your friend Laurie..that ice cream sounds soooooo good. i am so glad you are enjoying pregnancy...shopping and guilt free eating..woohoo! YUM! 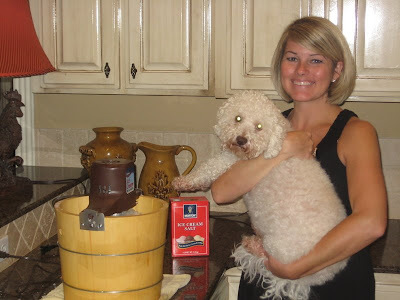 I am not a huge ice cream fan, but I LOVE LOVE LOVE homemade ice cream!!!! :-) Sounds like you had a great weekend! I actually thought about y'all when I turned on ESPN to check out how all the college games were going! Glad Harper enjoyed her first game! Enjoy your Monday!!!! 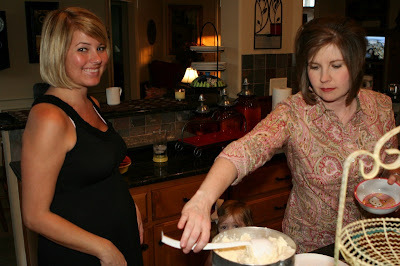 Kelly, you are such a cute pregnant mama! Oh yeah, I know that hill you're talking about. It's a HIKE for sure. Please, please, please climb up it on November 1 and meet me! You look so cute for the game, as always! I've been wanting to make homemade ice cream all summer and haven't done it. Looks yummy! We are doing homemade ice cream with our family tonight, too. Hope you have a great day, Kelly! You are a blessing! 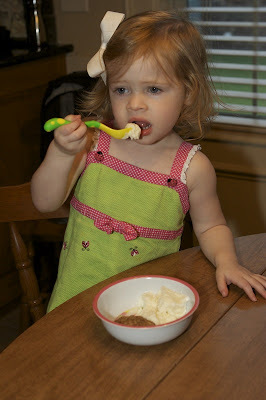 We had homemade ice cream on Sunday night too! I LOVE IT! Now Kirk is determined to find an ice cream maker for our us. I don't know though because I'm sure I'll want to eat it all the time! Can't wait to see Harper's dresses! Cute pic of your parents, and cute pic of you, Scott and Harper. Go Hogs! You are right. A win IS a win. That Emily and Sarah Kate are SO cute. 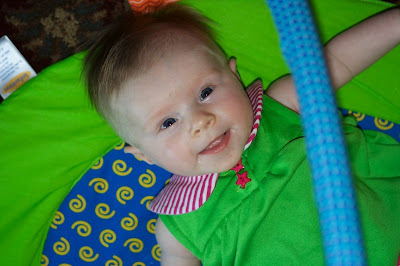 You and Laurie are going to have so much fun watching your girls grow up together. Harper has instant friends! Glad ya'll had a great weekend! Those pics of the girls are SO adorable! Love it! Here's my plan for parking and walking at the home games....Josh does both and drops me off as close as he can to the stadium! We walked soooo far! I told Josh at one point I was in labor and honestly I thought I was going to cause myself to go into labor. 35 weeks plus hills on campus are not a good combo! Some person I didn't even know offered to have their wife drive me to the stadium!! Haha! I must have looked pretty bad trying to walk! Sounds like a great weekend!! 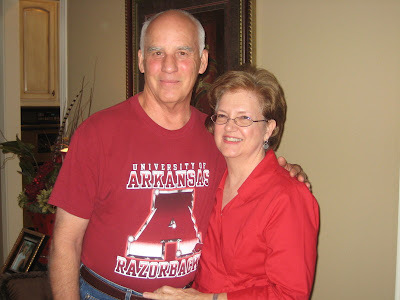 I am soooooo glad that we won...GO HOGS!! You need to try to make homemade Butterfinger ice cream...YUMMMM! Looks like y'all had a good time. I absolutely love the jeans you're wearing in this post...what kind are they?? They are maternity Citizens of Humanity. I have never loved jeans so much!! I got them off of e-bay for a great deal!!!! I just cannot wait to see Harper in her little Hogs cheerleading outfit!! Looks like you, your parents, and friends had a lot of fun! I'm so glad the HOGS won that game! Whew! Oh, and yes, you're right...we have all had cooking disasters. Just this weekend, I made a homemade German Chocolate Cake. When I pulled it out of the oven, it was as flat as a pancake! I used two eggs, instead of three. Of course, I'm still not convinced that I didn't forget some other vital ingredient. Believe me, we'll all been there! I love homemade ice cream! It always makes me think of my childhood ;)! I am so glad that Harper enjoyed her first Hogs Game ;)! I loved the picture of you and Scott before the game! You look so fashionable and adorable!!! We love homemade ice cream at our house and we haven't had any all summer, I just realized!! You do look super cute...next time I'm prego, I'll definitely get a great pair of jeans!! We're making homeade icecream for my dad's b-day this weekend. I'm going to use your recipe. Is the Pet milk evaporated milk and the Eagle Brand sweetened condensed milk? I grew up eating home made ice cream. I should make your M-I-L's recipe for my family. Jenn - No - I don't work at the U of A. Wish I did - in the athletic dept - that would be a dream job. ha! Our husbands aren't brothers but they will get a kick out of the fact that you asked. Laurie and my husband are actually cousins so we are all related a little bit. Laurie and I like to think we are sisters.